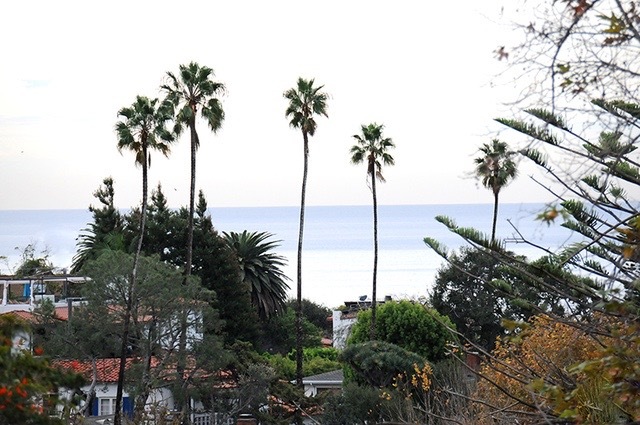 CLOSE TO THE BEACH--MID CENTURY RANCH WITH OCEAN AND CANYON VIEWS!! Apprx. 2000 s/f, 3 bdrm, 3 bath, Vaulted Wood Beamed Ceiling, Large Brick Fireplace, Hardwood & New Carpet, Scenic Views from most rooms, Large outside Deco Terrace, Colorful 1950's baths. Garden level entry to the 3rd bdrm/bath with Fireplace, Laundry Room + 2 Car Garage. Backyard is flat and surrounded with trees--Terrific Location, close to Canyon Elementary. Upgrade and live in 'As Is' or bring your Architect and totally Re-Design this lower Amalfi home for the New Year ! !